The Great Burkhan Khaldun Mountain and its surrounding sacred landscape is associated with Genghis Khan and the Mongolian nation as described in 'The Secret History of the Mongols'. 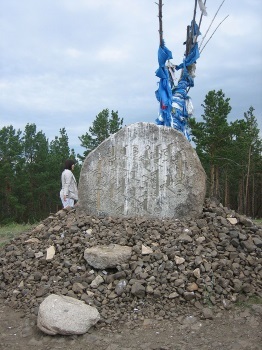 It is considered the most sacred mountain in Mongolia, with a fusion of Buddhist and shamanic features. In final stage of nomination, locations were limited from 3 to 1 by State Party. Sacred Binder Mountain and Baldan Bereeven Monastery were omitted. Boreal Forest or Taiga: "where the vast Central Asian steppe meets the coniferous forests of the Siberian taiga"
Birthplaces: Genghis Khan was probably born in 1162 in Delüün Boldog, near Burkhan Khaldun mountain. The mountain is closely associated with him. Cultural landscape not recognized: Specifically descr as a CL in AB eval! No type given - "Assoc" and "Continuing"?